Hello again. I haven't forgotten that my blog is here... neglected. In fact, it's been nagging in the back of my mind for days. I am so much more in awe of those who manage to blog regularly on top of fulltime work and actually still have time for the crafty projects to blog about. I'm slowly working into a new routine and my poor quilt has been as neglected as this blog. The one bit of creativity has been in my lunchbox. My rule for myself was that I was allowed to eat out once a week if I packed my lunch the rest of the time. The goal of this was for a healthy waistline AND pocketbook. 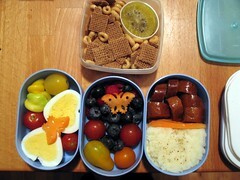 So far I've been keeping that up, with a mix of hastily packed leftovers and cute bento lunches. love.. *LOVE* The bento box lunches. they are so cute, and i can't believe you bought a heart shaped egg shaper. you rock. I personally don't find eating just vegetables unprepared to be work for me, but if you have a good selection of heirloom and other awesome produce, i could be turned around. hope the new job is treating you well! In fact I have a heart AND a star hardboiled egg mould since they come in a package of two.